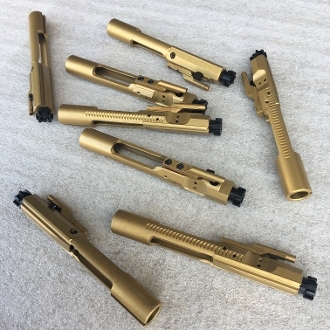 Complete TiN (Titanium Nitride) gold colored Bolt Carrier Group. Smooth & Protective TiN treated. 5.56/223 & 300 Blackout BCG. Super smooth finish and easy to clean. The finish is very hard and smooth, but some lubrication is still recommended since it's a moving part. Made in the USA by a quality manufacturer.